I am finding that, when reviewing films, more and more I get hung up on details. For example, in Get Out, I became fixated on why there were candles inside an operating room. In Tomb Raider, I became fixated on how a secret room hidden in a crypt for seven years could be so clean. Now, with A Wrinkle in Time, I cannot get over the fact that Calvin does not have red hair. I would say it's more sandy-brown than red, as I was expecting a fiery, bright, Conan O'Brien-type red hair. Maybe I'm the only one who cares more about the color of Calvin's hair than I do about the color of Meg's skin, but having read A Wrinkle in Time, it was a detail that stuck with me. A Wrinkle in Time tries, tries hard to be sweeping and magical, but it fails probably because it tries too hard. Meg Murry (Storm Reid) is an angry middle school student, sullen and withdrawn ever since her beloved father Alex (Chris Pine) disappeared four years ago. She loves her mother, Kate (Gugu Mbatha-Raw) and especially her adopted brother Charles Wallace (Deric McCabe), but she still feels the loss of Dr. Murry intensely. On a dark and storm night, Charles Wallace astonishes his family by being in the company of a flighty figure calling herself Mrs. Whatsit (Reese Witherspoon). She insists Meg 'isn't ready', but Charles Wallace insists there's more to his sister than first meets the eye. Later, on a walk Meg and her brother bump into Calvin (Levi Miller), who is clearly besotted with our Meg. Charles Wallace then rushes into a house where we meet his other friend, Mrs. Who (Mindy Kaling), who speaks only by using quotes from such legendary figures like Shakespeare and Outkast. What, you don't think one without the other? What do you mean, 'Oprah has a large ego'? Finally, in the Murry backyard, we encounter the greatest of the Mrs., Mrs. Which (Oprah Winfrey), a massive figure towering over all. They have tasked our three to find Dr. Murry, who has managed to travel through space and time through 'tesseracting', the ability to fold time where one can travel from one point in the universe to the other in an instant. Here, our three children are swept in an intergalactic hopscotch, swiftly going from planet to planet to find Dr. Murry. They also have to face against The IT, Bringer of Darkness that reaches to all corners of the universe, even Earth, where The IT unleashes all malice, hurt, and negativity on the planet. They meet The Happy Medium (Zack Galifianakis), who helps them all tap into where Dr. Murry is at. Finding that Dr. Murry is trapped by The IT on Camazotz, a planet of pure darkness where the Three Mrs. cannot go, at first the entities want to return to Earth and regroup. Meg's power, however, takes them to Camazotz. The Three Mrs. have no power there, but give the three of them gifts to fight The IT. However, they must undergo a few troubling moments and be separated from time to time. Once reunited, they encounter The Man With the Red Eyes (Michael Peña), a minion of The IT, who takes over Charles Wallace. Charles Wallace in turn torments Meg and Calvin, but Meg manages to reunite and rescue her father. It becomes a battle for Charles Wallace's soul as Meg fights The IT, and in the end, all's well that ends well. It's a sad thing when something that could have worked does not, and A Wrinkle in Time has many qualities that were undone by either a bad choice or altering Madeleine L'Engle's classic novel. Let's look at the qualities first. 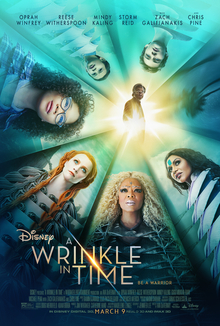 A Wrinkle in Time is blessed by some wonderful children actors, a trio that I think has done wonders and should have good careers ahead of them. Reid does excellently as Meg. She is an ideal actress to play the character, as Meg is supposed to be an ordinary girl, gifted with no special powers save her intelligence and courage. Pity she didn't have the braces as she did in the book, but that's not a detail I got hung on. Reid does an especially wonderful and moving job when working with an underused Pine, their reunion extremely moving and well-performed. Miller, despite a lack of red hair, shows that his performance in Pan was no fluke. He proves quite gentle and sweetly smitten with our Meg, and while perhaps director Ava DeVernay might have directed him to be too soft-spoken it still was a good performance. The real star was McCabe as young Charles Wallace. He stole the show as our genius tyke, fully aware of things and taking everything in stride. He even manages to be quite menacing when tormenting Meg under the control of The IT. It's a pity then that the adults are the ones who fare badly. Pine and more shamefully Mbatha-Raw were wildly underused, and in some cases directed badly (Mbatha-Raw's reaction to seeing this strange woman flittering around her living room makes it look as if she isn't too shocked to see such things). Also underused was Peña as The Man With Red Eyes, or Red for short. Witherspoon and Kaling were fine but nothing to show they were really these ethereal beings or wise figures. As for Winfrey, it's almost comical to see her shown as this almost literal gigantic Goddess, though it probably reveals how to many, perhaps to Winfrey herself, Winfrey literally is a gigantic Goddess. The flaws in A Wrinkle in Time unfortunately undo all the good, mostly due to Jennifer Lee and Jeff Stockwell's adaptation. Yes, many things had to be cut or altered to fit into its running time, but it tries too hard to be 'magical' when it ends up empty. Sometimes, the film, intentionally or not, echoes other films. When the Three Mrs. were giving gifts, it looked as if they were cribbing from both Sleeping Beauty and Clash of the Titans. The film's efforts to force magic kept flopping. Take Mrs. Who for example (as a side note, should I now start calling the 13th Doctor on Doctor Who 'Mrs. Who'?). She speaks only with quotes from others, and to be otherworldly about it, but the film wants to somehow suggest that her quoting Chris Tucker is somehow on the same level as quoting Winston Churchill or The Buddha. One figure not quoted is Jesus Christ, despite the original novel's heavy quotations from the Old and New Testament. Mrs. Who at one point quotes a variation of 1 Corinthians 1:27 (He uses the foolish things of the world to shame the wise), but I suppose in their efforts to not offend, Chris Tucker was found a suitable substitute to Christ. A bigger flaw is that A Wrinkle in Time is made to be less about a cohesive journey and more planet-hopping, going from place to place with little to connect them. On Camazotz we go from a creepy cul-de-sac to a crowded beach to where one wonders the why and how of it all. The cul-de-sac sequence was so obviously creepy you think Calvin has to be a total idiot to come close to being taken in by it, food or no food. Worse, once Meg turns down the invitation for them, it's all forgotten. Charles Wallace's mind control just happened, and after a fierce storm overwhelmed Calvin and Meg, we see Charles Wallace dry and unhurt. How he got over the massive mountain or survived the storm to arrive perfectly fine near them happened because...reasons. The second flaw is DeVarnay's efforts to be so 'magical' that at times it comes across as unintentionally comical. Take when they are in the first planet, Uriel. I know it's a Disney movie, but did the gossiping flowers really have to bring back memories of Alice in Wonderland? Even worse, when Mrs. Whatsit 'changed clothes', her spinning around first made me think she was going to turn into Wonder Woman, then the end result made her look like a cross between the Sprite from Fantasia 2000 and a flying piece of lettuce. When the kids are riding around on The Flying Lettuce known as Mrs. Whatsit, I was waiting for them to burst out into You Can Fly! Again and again, DuVernay wants us to think this is all wonderful and magical, and more often than not it fails. When we meet Mrs. Whatsit and Mrs. Who, the camerawork tries to make it all so amazing, but it falls flat despite the music. When we meet Mrs. Which, that is a little more magical because it looks slightly ethereal. It isn't that DuVernay is not a good director. She's an extremely competent one who can create powerful and moving moments as she did in her shamefully overlooked Selma. She got good performances out of young actors and had some genuinely powerful scenes like the father and child reunion. She also integrated songs into the film quite well, including a track, Flower of the Universe, by the legendary Sade. At least A Wrinkle in Time has a strong shot at Original Song nominations. I think, however, that maybe her focus was more on creating 'empowering' characters who would 'be warriors' than she was in making a more cohesive film. Some of the visual effects were ghastly: a particularly bad moment is when we see Meg admiring the gossiping flowers where the green-screen was so obvious it was almost painful to watch. Other times, you end up puzzled, such as when Charles Wallace refers to The IT as 'The Happy Sadist', or at least that's what I heard. Finally, I'll touch very briefly on any controversy about the casting. I've long-held that if a role does not specifically call for a particular race, ethnicity or gender, then by all means that role should be opened up. I applaud A Wrinkle in Time for having a minority lead and minority actors in other roles, and if people want to take pleasure out of that and see that as a great moment in history, more power to them. Perhaps they went a bit overboard in the virtue-signaling: the "Women in Literature" displays, especially of Maya Angelou, and being at "James Baldwin Middle School" all being prominently displayed might have been a bit overdone. However, Storm Reid proved an excellent casting choice and far better than her material. As I said, I'm more upset that Calvin O'Keefe's hair wasn't red than whether Meg Murry's hair was frizzy or straight. A Wrinkle in Time is not the adaptation the book deserves, though given the novel any adaptation would have been cumbersome. There were great qualities in it, particularly Reid, Miller and McCabe. I will say that no film should get a pass because of who makes it or who is in it. A good film is a good film, a bad film is a bad film. A Wrinkle in Time is not a terrible film, but it could have and should have been so much better.